Christmas Arts and Crafts for Kids to Make! 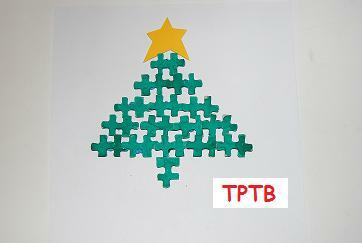 Painted Puzzle Piece Christmas Tree – This is a great activity for all those puzzles that no longer have all the pieces. Lay the puzzles pieces out on newspaper or a paint tray. Let the kids brush or finger paint green tempera onto the pieces. Allow the pieces to thoroughly dry, and then use poster putty to adhere the pieces in a Christmas tree shape. Use star stickers or cut outs for the top of the tree. 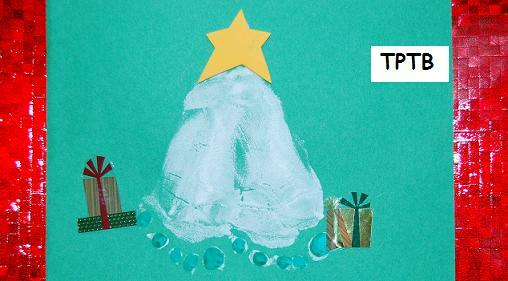 Fingerprint Christmas Tree – Put green tempera paint on a paint tray or plate and let the kids fingerprint a tree shape. For very young children, outline a tree shape for them to fingerprint or cut the fingerprinted paper into a tree shape when they are finished. Allow the green fingerprints to dry completely before adding fingerprint “lights” to the tree. For infants and toddlers, use your finger to apply white paint to the foot. Press the paper gently on the foot while holding the child. Footprint Christmas Tree – Put white tempera paint on a paint tray and let the kids use a sponge to lightly paint their non-dominant foot with white paint. Lay green paper onto newspaper or a cloth protective covering, then have the children step gently onto the paper to make the footprint. Use stickers for the star and presents after the footprint has dried. These make great gifts for grandparents or parents. Put the child’s name and the date the footprint was made on the tree. For special gifts, put the footprint in a special frame for a keepsake that will last for years. Fingerprint Christmas Lights – Print the glitter lines (linked here) Line Guide for Fingerprint Lights for each of the children. 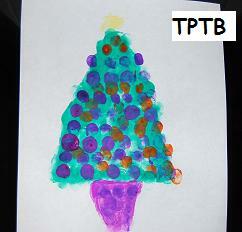 Have the children pick the colors of fingerpaint/tempera that they would like to use for their Christmas lights. Using the lines as a guide, have the children make fingerprints above and below the line to resemble lights. 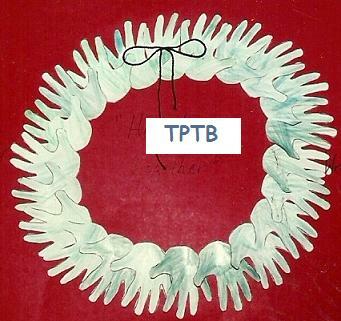 Handprint Wreath – Have the children trace around their non-dominant hand with a crayon/marker/or pencil. The children can color or paint the handprints red or green. Assist younger children in cutting out the handprints. Older children can cut around the fingers instead of cutting out every one, if desired. Have the children help glue the handprints in a circle on a red or green poster board. Remind the children that overlapping hands are a symbol of working together in peace and love. 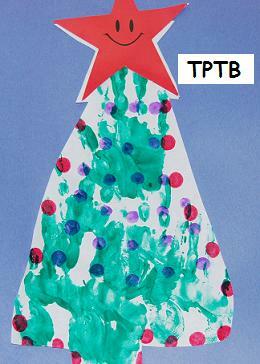 Handprint Christmas Tree – Put green tempera paint on paint trays for the children. The children can use a paintbrush to paint their non-dominant hand or put their hands directly into the paint tray. If using the paint trays, make sure there is not TOO much paint in the tray or you will end up with paint “globs” instead of prints. Have the children make one handprint at the bottom of the paper for the tree trunk. The children can then make 2 or 3 handprints for the body of the tree and one handprint for the tree top. When the handprints are dry, let the children decorate their tree with markers, dot markers, stickers, or collage materials. Our Christmas and Gingerbread Thematic Units are now available for download via this blog! Both units have more ideas for art as well as literacy, math, science, large motor, dramatic play, and food craft resources. « Christmas Season Food Crafts, Snowflakes, and a Christmas Countdown!